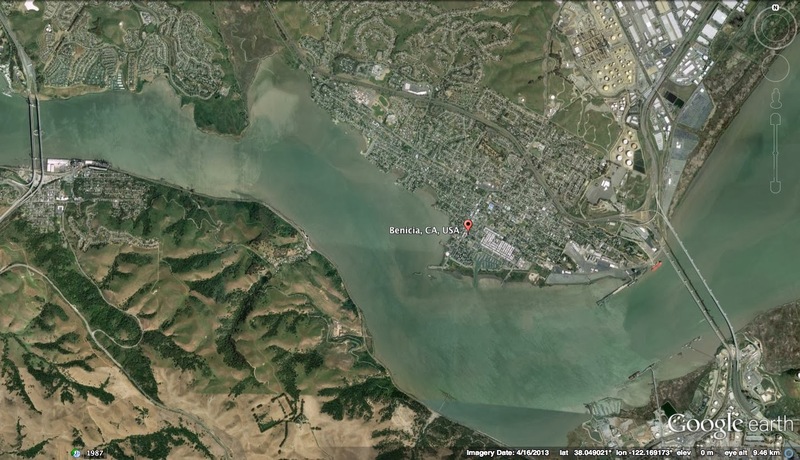 At the east end of the Carquinez Strait are the three Benicia Martinez Bridges (carrying I-680 between the cities of Benicia and Martinez). The photo above shows the new northbound Benicia Martinez Toll Bridge, a segmentally constructed prestressed concrete box girder bridge. I'm standing on the north side of the Strait photographing this bridge with a telephoto lens that considerably foreshortens the bridge. In the background is an oil refinery that includes a terminal in the Strait for tankers to offload their oil. 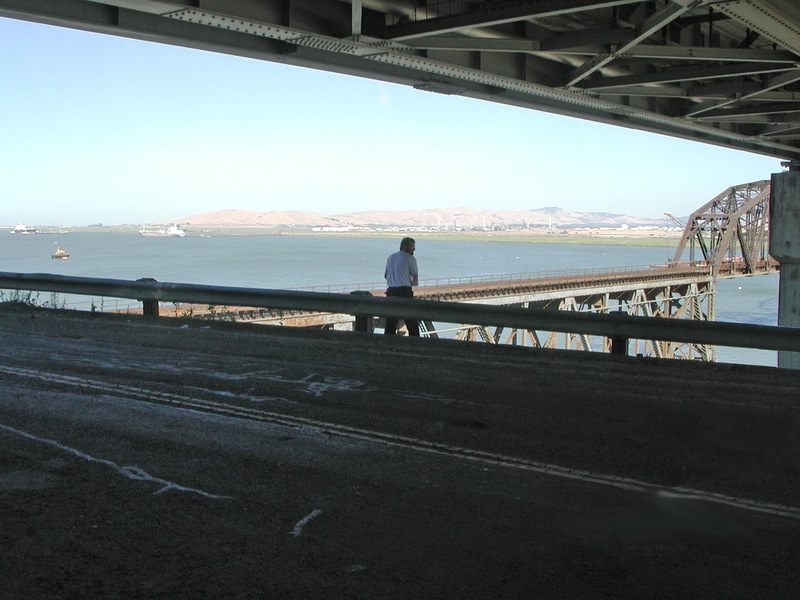 Besides the new northbound bridge, there is an old steel truss bridge that was retrofit with giant friction pendulum bearings in the 1990s (see photo below). 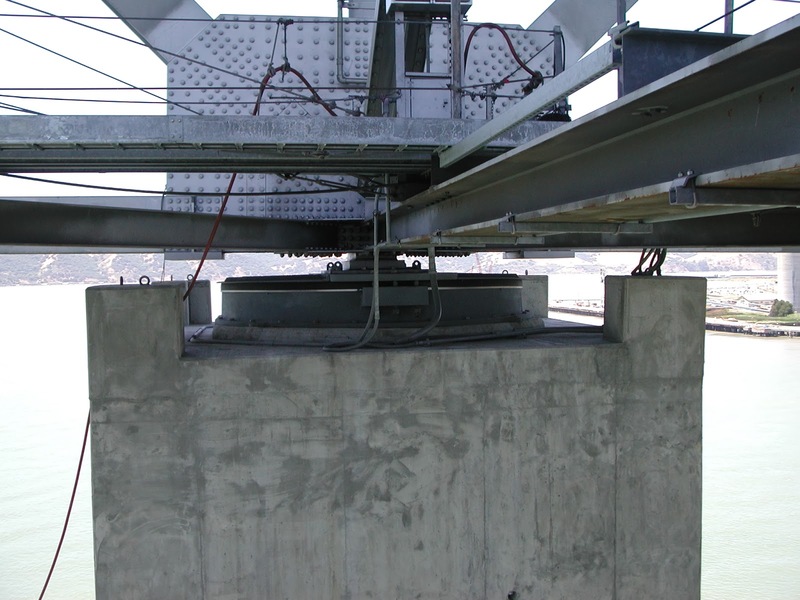 These bearings reduced the inertia load to the piers and foundations, saving Caltrans the expense of retrofitting the foundation. 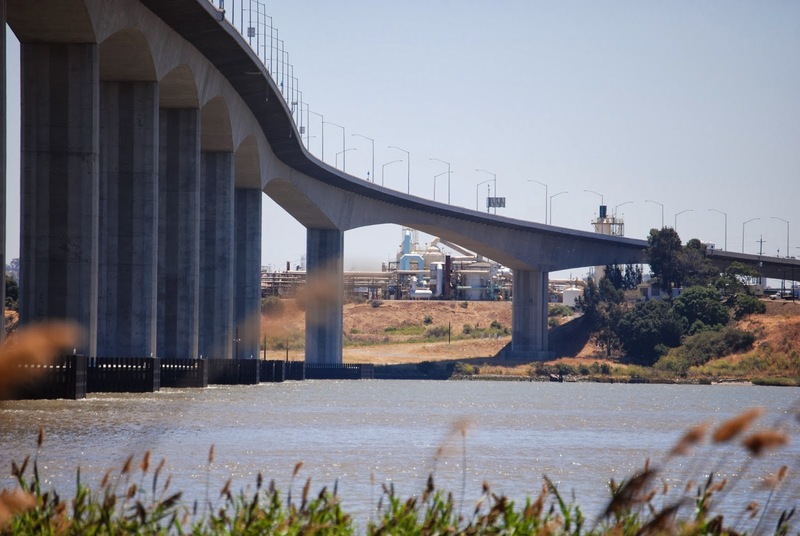 Both the northbound bridge and the southbound retrofit are part of just a handful of bridges designed to remain in service after a large earthquake. 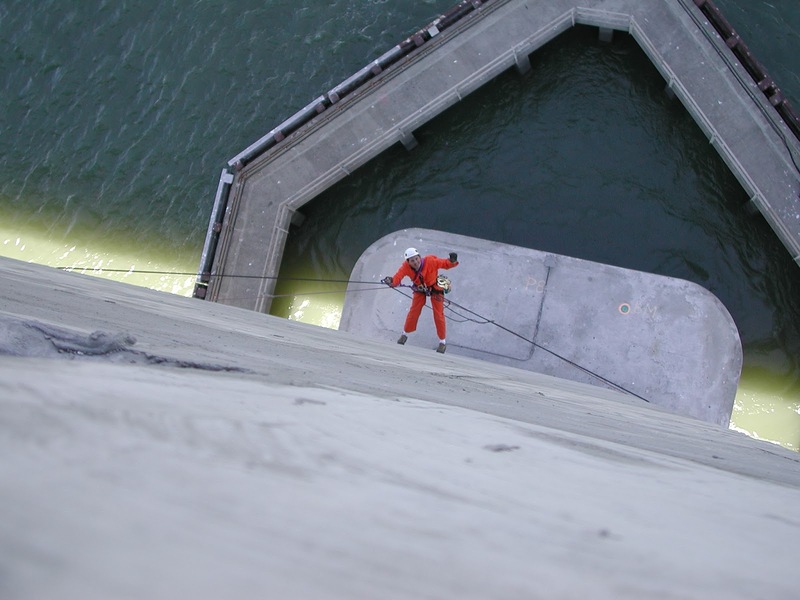 I had forgotten that we had once practiced our rope climbing techniques on a reinforced concrete leg of the retrofitted bridge (before the new bridge was built). The columns were so tall that we had to tie two static lines together and got to practice climbing above and below the knot as well as how to move from side to side around the column. Between the northbound and southbound bridges is an old (1930) railroad bridge that still gets plenty of use from the BNSF, UP, and Amtrak trains that cross it every day. The bridge includes a lift span over the shipping channel. In fact, there were so many trains, that it was a hassle while they were trying to work on the retrofit because they had to clear the tracks every time a train came by. The photo below shows the railroad bridge before the northbound Benicia Martinez Bridge was constructed. A better view of the railroad bridge was in the June 5, 2001 blog. Solano County, California Bridges: Benicia Martinez Bridges across Carquinez Strait by Mark Yashinsky is licensed under a Creative Commons Attribution-NonCommercial-NoDerivatives 4.0 International License.